It is known that everyone has a calling in life, and after years of searching for my identity, I finally came to the realization that mine was art. The presupposition that art is limited to a paintbrush and a white canvas is blasphemy. However, my canvas is a bare face and the paintbrushes are my cosmetic brushes laying in the drawers of my vanity. Since I was young, art has been my calling. That was the very way I, as a person, expressed myself. My middle school years were when I first got into makeup and I realized that something that looked so easy can be deceptive. Learning this was a process. It did not come easy to me, therefore there were times where I felt that I was never going to progress and achieve the level of talent I was hoping. It took tries after tries and repeated practice to get even the merest single concept down. As I saw myself improving and growing as an aspiring makeup artist, my love for the art of makeup grew immensely. 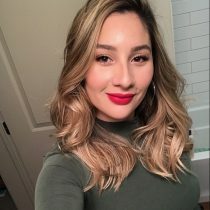 When I started getting recognition via social media, it shocked me. I did not expect the plethora of support that I received from strangers all over the world. I kept putting out my best work, when one day, I reached a groundbreaking and emotional experience that had the internet going crazy. I had done a couple of makeup looks inspired by Kanye West’s albums. It had gotten the attention of a news account that was Kanye related and they retweeted my thread to their entire fan base. Immediately, my twitter crashed. People all over the world, whether they were into makeup/art or not, were in awe of the work I had created. People were recreating my work and even called me an inspiration to others. Just when I thought I couldn’t be more flattered I got an email from a journalist for Cosmo Magazine that wanted to feature a section about me and my artwork. Soon, many articles were written featuring my work by well-known websites like Daily Motion and many others. My latest collaboration was Nike Air Max inspired makeup looks for Finish Line Women. I love shoes and I love makeup so this was the perfect opportunity to put two of my favorites together and create looks inspired by the shoes. Collaborating with Finish Line Women was truly an amazing experience and I am so excited for what’s to come! 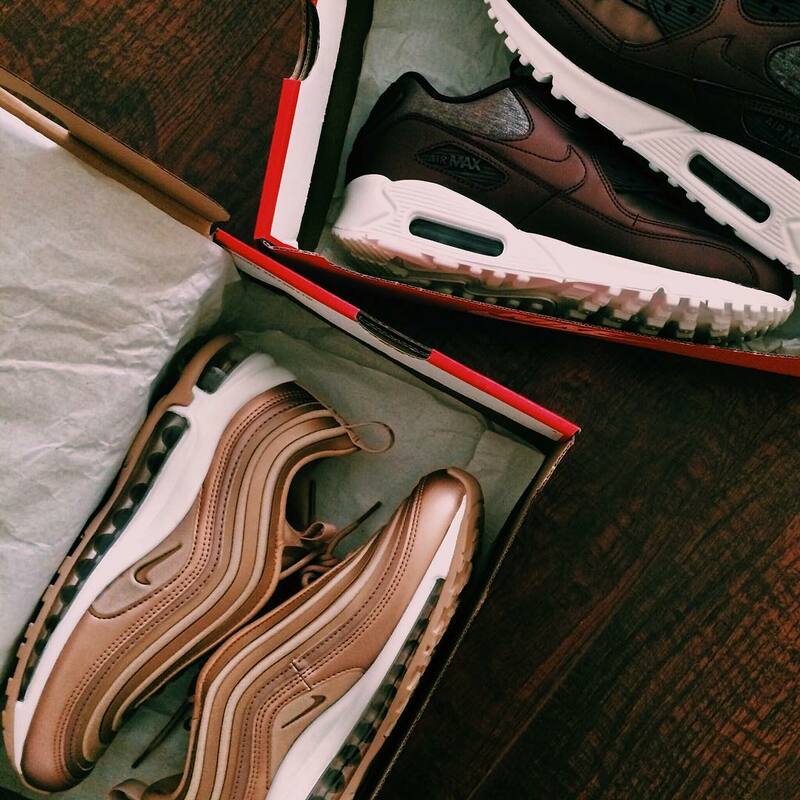 Here are two looks, one inspired by the Air Max 90 Metallic Mahogany and the Air Max 97 Metallic Red Bronze. I really wanted to focus on the beautiful Burgundy color of the Air Max 90’s for this look, but also the little purple and glittery details, so I created something with different shades of purple and topped it off with a metallic purple lip. 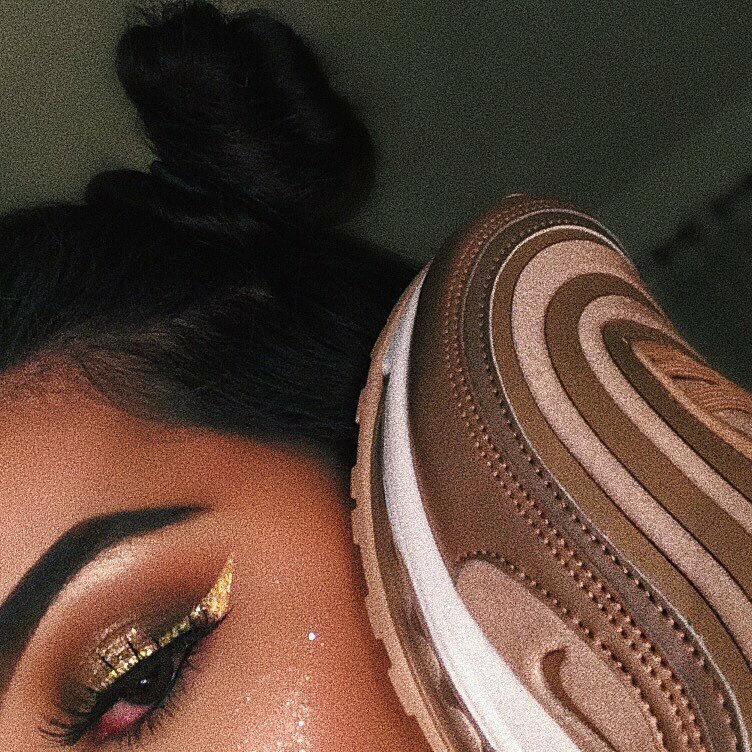 For the Nike Air Max 97’s I created a subtle bronze/gold halo eye with added glitter for extra dimension and topped it off with gold eyeliner to make it really pop! 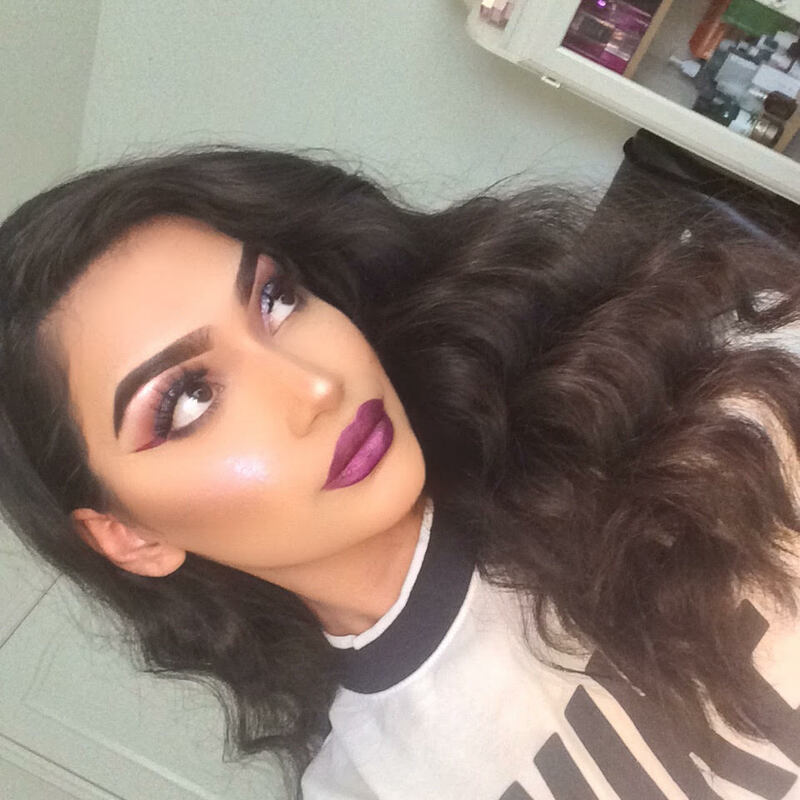 Makeup artistry defines a little part of me and is a talent I am proud of possessing. To many, it might not seem like a big deal, but for me it is a part of Sarah Khan that is never leaving. It is a part of many things that make me up as a whole. From learning how to start by watching YouTube tutorials of my favorite artist to eventually getting articles written about me online and being called other people’s inspiration is a blessing. This is something I would not have been able to fathom in my middle school years. I take everything day by day and I hope to succeed and inspire more people as I am ever growing as an artist. Keep up with Sarah on Instagram and check out all things #WeAreMore on @finishlinewomen.